So... I never did get around to learn that Spanish language. My defence is that my mental hard drive is overworked already as it is, having gotten around to learning Hebrew, Yiddish, Arabic, Swedish, French... and Middle Kingdom hieroglyphs. It would be such a blow to have to admit that I'm actually just... lazy. So, at times the life in Spain has some very confusing moments in store. I often find myself wondering why suicide bombers would warrant that many parks dedicated to their memory. Until The Gentleman kindly reminds me that Parque de Bomberos is, in fact, something as undramatic as a fire station. Another thing I found puzzling during tapas bar crawls was salmorejo. My ethymological analysis kept telling me it must have something to do with salmon. But nope. It is cold tomato soup. 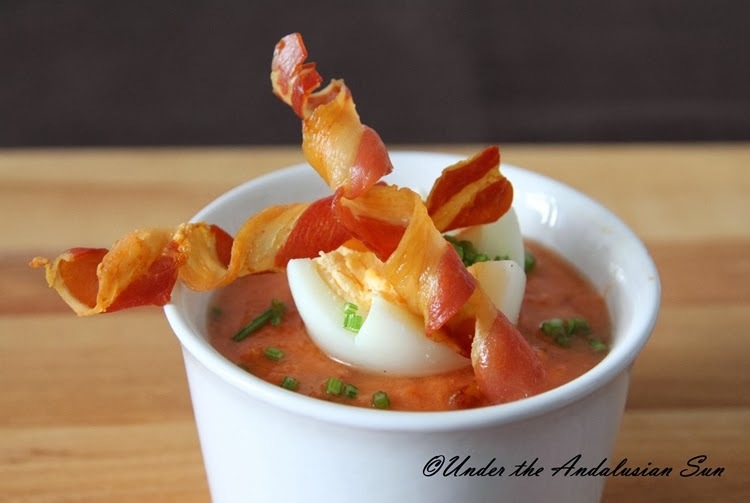 The Andalusian, lesser known chunkier country cousin of the more famous gazpacho. You've already encountered it once in this blog - at that luxury tapas bar in Malaga. The soup originally hails from Cordoba. Much like with meatballs and other traditional dishes there are as many recipes as there are cooks, but one things they all have in common is the way they're served with boiled egg, Serrano ham and occasionally with chopped onions. Some recipes call for toasted almonds, onions or even green peppers. 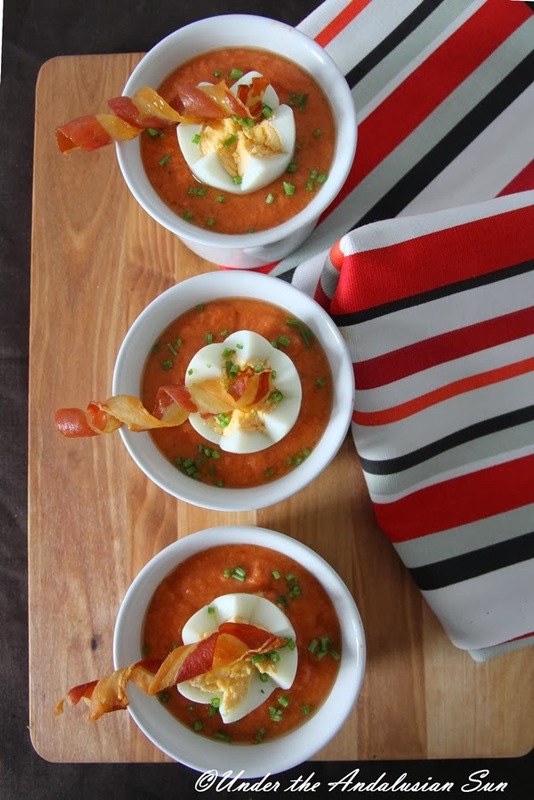 But as I find those are getting too close to the gazpacho territory, I kept mine puristic and only included bread, tomatos, olive oil, sherry vinegar and garlic. Though I did add some sundried tomatos to play up the tomatoey tones. Traditionally this is made with stale bread in which case you should soak it in water and then (with the excess liquid squeezed out) add it to the blender. Mine was relatively fresh, so I added it in straight away. Any white bread will do. I used sliced loaf with the crusts cut off. But don't you worry, they won't go to waste either. Along with the rest of the leftover bread they get turned to bread crumbs which in turn can be used for croquetas or poor man's mussels! Usually this is served as a starter in which case this recipe serves 6. As a light lunch this would be enough for 3. Cut the tomatos in half , remove the hard bits and scrape the seeds out. Place them in the blender with garlic, bread and sherry vinegar. Blizz until smooth and billowy. Then add the oil, either in one continuous stream through the hole in the lid or little by little, blizzing as you go along. Check the taste, season and add more oil, bread or vinegar to your liking, but remember that this is supposed to be quite thick. Chill before serving -at least 2 hours but preferably until the next day. Serve with the guarnicions of your choice. I find that the best ham for this is the more aged variety or paleta. 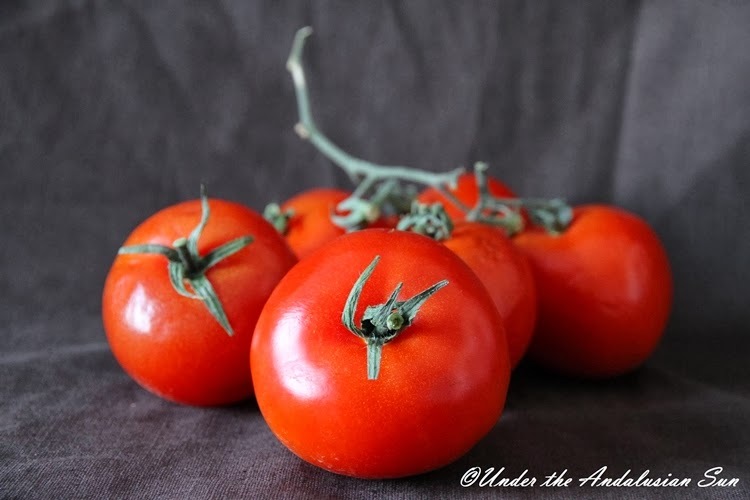 Note: The Cordoban variety has a lot more bread - those preferring that version can omit the sundried tomatos, double the amount of bread and add more oil.